Tank Details: 48inch by 18inch by 18 inch. 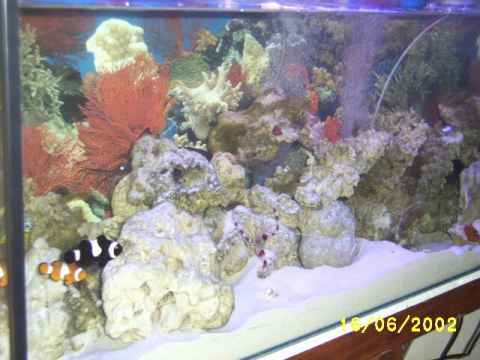 The Fish: 3 wrasse,2 clownfish,1 catfish,1 blue damsel,1 coral banded shrimp,1 blennie,1 bi colour angel. Comments: lighting-4 fluorescent tubes,one actinic tube,soon updating to halide,substrate -sand-live rock,soft coral,1 anemone,mushroom coral,filtration-2 eheim pro wet dry cannister filters,1 internal power filter.200 watt heater.....tank doing well regular water change every 2 weeks..slowly adding more coral.